Play and Say Therapy: Pediatric Speech therapy clinic in Chicago. | About Us. We utilize a naturalistic play-based approach with a mix of traditional speech language techniques to assess and treat a variety of speech and language difficulties. 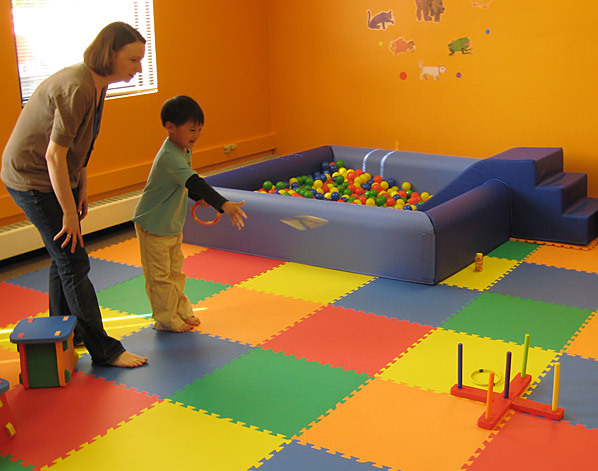 We provide a multi-sensory environment that promotes the development of speech and language skills. We believe that children learn best when they are engaged in activities that are functional and motivating and that collaboration with family members and other professionals is key to the development of a child's full potential. We provide therapy on the principle that motivation is a significant contributing factor to a child's ability to learn and develop new skills. We believe that when children are motivated by an activity they are more likely to be attentive and active participants in the learning process. We believe that through play a child develops new skills by way of observation, exploration, imitation, interaction and discovery. Play also provides an opportunity for a child to develop the key foundation skills necessary to develop speech and language. When a child learns skills through play they are more likely to carry those new skills over to a variety of situations due to the naturalistic environment in which the skill was developed. A child's gross and fine motor systems are active when a child is engaged in play. The stimulation of these systems encourages the development of speech and language skills. A child will sit up, crawl and walk before they develop words. By moving through their environment they are able to use all of their senses to interact with and explore the objects and people around them. Our primary goal is to help children express their wants and needs and to feel as if they're being understood. Click on image to view it in full size.